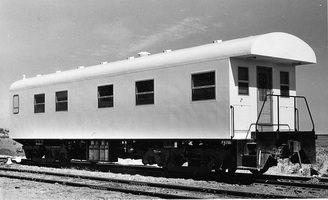 Steel pay cars built by "Commonwealth Engineering". Steel pay car built by "Commonwealth Engineering". 20.10.1986 TIMS/WMS: wagon "PA 280 E" alteration complete: "fitting of split system air conditioning to PA 280 & PA 281 pay vans. PA 280 & 281. (RS4154)". 24.11.1988 TIMS/WMS: wagon "PA 280 E" alteration complete: "provision of hot water supply to hand basins & kitchen sink in pay vans. PA 280, 281 & 367. (RS4361)". 11.07.1989 TIMS/WMS: shows wagon "PA 280 E"as having repair "air brake system complete". 11.07.1989 TIMS/WMS: shows wagon "PA 280 E"as having repair "hand brake assembly complete". 04.06.1990 TIMS/WMS: shows wagon "PA 280 E"as having repair "air brake system complete". 04.06.1990 TIMS/WMS: shows wagon "PA 280 E"as having repair "bogie brake blocks x92". 04.06.1990 TIMS/WMS: shows wagon "PA 280 E"as having repair "bogie complete". 04.06.1990 TIMS/WMS: shows wagon "PA 280 E"as having repair "coupler knuckle pin". 04.06.1990 TIMS/WMS: shows wagon "PA 280 E"as having repair "coupler knuckle". 04.06.1990 TIMS/WMS: shows wagon "PA 280 E"as having repair "hand brake assembly complete". 20.08.1990 TIMS/WMS: shows wagon "PA 280 E"as having repair "air brake system complete". 20.08.1990 TIMS/WMS: shows wagon "PA 280 E"as having repair "bogie brake blocks x92". 20.08.1990 TIMS/WMS: shows wagon "PA 280 E"as having repair "bogie complete". 20.08.1990 TIMS/WMS: shows wagon "PA 280 E"as having repair "coupler complete". 20.08.1990 TIMS/WMS: shows wagon "PA 280 E"as having repair "draftgear complete heavy". 20.08.1990 TIMS/WMS: shows wagon "PA 280 E"as having repair "end complete". 20.08.1990 TIMS/WMS: shows wagon "PA 280 E"as having repair "hand brake assembly complete". 20.08.1990 TIMS/WMS: shows wagon "PA 280 E"as having repair "other brake cylinder complete". 20.08.1990 TIMS/WMS: shows wagon "PA 280 E"as having repair "top centre plate". 20.08.1990 TIMS/WMS: shows wagon "PA 280 E"as having repair "train pipe". 24.10.1992 TIMS/WMS: shows wagon "PA 280 E"as having repair "vehicle recommended condemn". 03.02.1993 TIMS/WMS: shows wagon "PA 280 E"as having repair "vehicle sold". - Moved to Canberra, ACT. 20.10.1986 TIMS/WMS: wagon "PA 281 N" alteration complete: "fitting of split system air conditioning to PA 280 & PA 281 pay vans. PA 280 & 281. (RS4154)". 24.11.1988 TIMS/WMS: wagon "PA 281 N" alteration complete: "provision of hot water supply to hand basins & kitchen sink in pay vans. PA 280, 281 & 367. (RS4361)". 29.09.1989 TIMS/WMS: shows wagon "PA 281 N"as having repair "air brake system complete". 29.09.1989 TIMS/WMS: shows wagon "PA 281 N"as having repair "hand brake assembly complete". 26.10.1989 TIMS/WMS: shows wagon "PA 281 N"as having repair "air brake system complete". 26.10.1989 TIMS/WMS: shows wagon "PA 281 N"as having repair "bogie brake blocks x92". 26.10.1989 TIMS/WMS: shows wagon "PA 281 N"as having repair "brake block RB95". 26.10.1989 TIMS/WMS: shows wagon "PA 281 N"as having repair "coupler trigger lever". 26.10.1989 TIMS/WMS: shows wagon "PA 281 N"as having repair "end complete". 26.10.1989 TIMS/WMS: shows wagon "PA 281 N"as having repair "hand brake assembly complete". 26.10.1989 TIMS/WMS: shows wagon "PA 281 N"as having repair "top centre plate". 26.10.1989 TIMS/WMS: shows wagon "PA 281 N"as having repair "train pipe". 26.10.1989 TIMS/WMS: shows wagon "PA 281 N"as having repair "wear plates & saddles". 06.04.1992 TIMS/WMS: shows wagon "PA 281 N"as having repair "air brake system complete". 06.04.1992 TIMS/WMS: shows wagon "PA 281 N"as having repair "bogie bearers". 06.04.1992 TIMS/WMS: shows wagon "PA 281 N"as having repair "hand brake assembly complete". 06.04.1992 TIMS/WMS: shows wagon "PA 281 N"as having repair "top centre plate". 28.09.1993 TIMS/WMS: shows wagon "PA 281 N"as having repair "wheel set". 09.12.1993 TIMS/WMS: shows wagon "PA 281 N"as having repair "wheel set". 15.11.1994 TIMS/WMS: shows wagon "PA 281 N"as having repair "Vehicle Complete". 24.10.1995 TIMS/WMS: shows wagon "PA 281 N"as having repair "Vehicle Complete". 30.5.1997 TIMS/WMS: shows wagon "PA 281 N" in AN "Mainland Division". Run Restriction: "Vehicle suitable for use on AN lines only on gauge(s) shown"
Diagram Book Page No. : "NS 124"
2.2006 Sold to "National Railway Museum". 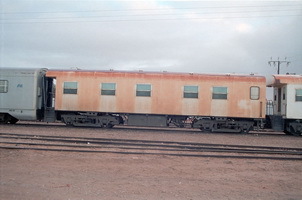 16.2.2006 Transfered by road from Islington Works to the "National Railway Museum" at Port Adelaide. 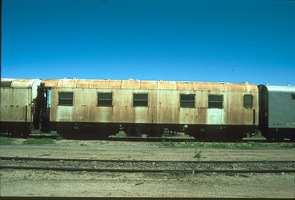 29.9.1971 Entered service as narrow gauge "NPA 88" on the Central Australia Railway. 25.3.1982 Converted to standard gauge and recoded "PA 367". 24.11.1988 TIMS/WMS: wagon "PA 367 M" alteration complete: "provision of hot water supply to hand basins & kitchen sink in pay vans. PA 280, 281 & 367. (RS4361)". 16.05.1989 TIMS/WMS: wagon "PA 367 M" alteration complete: "fit 1.8 mm thick lead sheet to the floors of all standard gauge passenger cars, including I.P. cars. (RS4420)". 11.07.1989 TIMS/WMS: shows wagon "PA 367 M"as having repair "coupler internal locking parts". 11.05.1990 TIMS/WMS: shows wagon "PA 367 M"as having repair "air brake system complete". 11.05.1990 TIMS/WMS: shows wagon "PA 367 M"as having repair "bogie brake blocks x92". 11.05.1990 TIMS/WMS: shows wagon "PA 367 M"as having repair "hand brake assembly complete". 09.07.1990 TIMS/WMS: shows wagon "PA 367 M"as having repair "end hose". 23.06.1992 TIMS/WMS: shows wagon "PA 367 M"as having repair "bogie spring". 01.07.1992 TIMS/WMS: shows wagon "PA 367 M"as having repair "air brake system complete". 01.07.1992 TIMS/WMS: shows wagon "PA 367 M"as having repair "bogie complete". 01.07.1992 TIMS/WMS: shows wagon "PA 367 M"as having repair "bogie wear plates". 01.07.1992 TIMS/WMS: shows wagon "PA 367 M"as having repair "hand brake assembly complete". 01.07.1992 TIMS/WMS: shows wagon "PA 367 M"as having repair "other brake cylinder complete". 28.10.1992 TIMS/WMS: wagon "PA 367 M" alteration complete: "remove fixtures and fit lead sheet and carpet to the floor of PA367 other work to be undertaken as directed by the manager locomotive drivers. PA367. (RS4740)". 04.11.1992 TIMS/WMS: shows wagon "PA 367 M"as having repair "floor carpet". 04.11.1992 TIMS/WMS: shows wagon "PA 367 M"as having repair "floor complete". 07.01.1993 TIMS/WMS: shows wagon "PA 367 M"as having repair "air brake system complete". 07.01.1993 TIMS/WMS: shows wagon "PA 367 M"as having repair "bogie bearers". 07.01.1993 TIMS/WMS: shows wagon "PA 367 M"as having repair "bogie complete". 07.01.1993 TIMS/WMS: shows wagon "PA 367 M"as having repair "end complete". 07.01.1993 TIMS/WMS: shows wagon "PA 367 M"as having repair "hand brake assembly complete". 07.01.1993 TIMS/WMS: shows wagon "PA 367 M"as having repair "other (not elsewhere specified)". 07.01.1993 TIMS/WMS: shows wagon "PA 367 M"as having repair "train pipe". 07.01.1993 TIMS/WMS: shows wagon "PA 367 M"as having repair "wheel set". 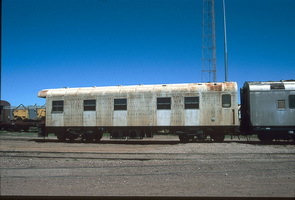 - Stored at Port Augusta. 30.5.1997 TIMS/WMS: shows wagon "PA 367 M" in AN "Mainland Division". Remarks: "PAY VAN;EX NPA 88"